Beginning with 1949, the Department had entered into annual contracts with the Town (of New Scotland). Although the amounts increased through the years, other sources of revenue were needed to balance the Fire Department budget. Punkintown Fair was the primary source of these funds; during the decade from 1972-1981, Punkintown Fair provided $10,000.00 or more annually. While this was not the only fund raising effort, it was a sbstantial one. in the 70’s, the district remained the same as it was during the first twenty-five years: the fire protection distrct is located in the northwestern sector of Town, and surrounds the Village of Voorheesville, which has its own fire service. The New Salem district covers approximately twenty-three square miles, or about 40% of the land area of the Town. 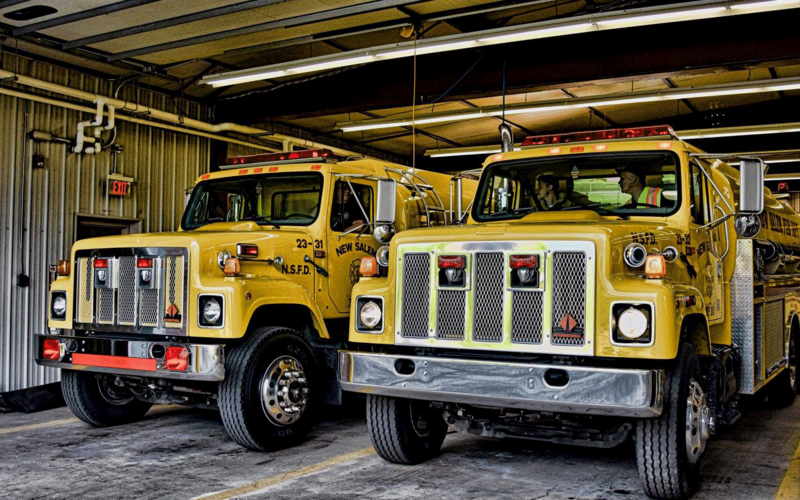 In August, 1971, a 1967 Mack diesel tractor was added to the fleet, and, noting the color yellow’s greater visibility, the firemen decided to change the color of the fire trucks from red to yellow. Another change during the decade involved land and buildings. In order to maintain the fleet, land purchases were necessary, as was the building of a pole barn; a conversion of the truck area of the first firehall into a lounge was completed before Christmas of 1981. At that time, there were only a dozen fire hydrants in the district, the same number that were present at the beginning of the decade. Departmental participation in parades during the ’70’s earned a second place trophy for a “Legend of Punkintown” float in the Clarskville Bicentennial celebration. Two more trophies were earned in 1981, at the Firemen’s Association State of New York (FASNY) convention in Rotterdam, and at the Albany County Firemen’s Association Convention in Delmar. For additional recreation, the Department organized a softball team, and sponsored bowling teams with the Auxiliary. In February of 1987, Nancy Hannmann, daughter of a fireman and an Auxiliary member, joined the Department as its first woman firefighter. Two more women joined in the next year. For the 13th Albany County Fireman’s Association Convention in 1989, the New Salem Volunteer Fire Department played host, with Hurricance Hugo being an unwelcome guest. A ladder truck, with a 65′ ladder and 500 gallon tank, was added to the fleet in 1991, and in 1994, 9-1-1 was initiated. 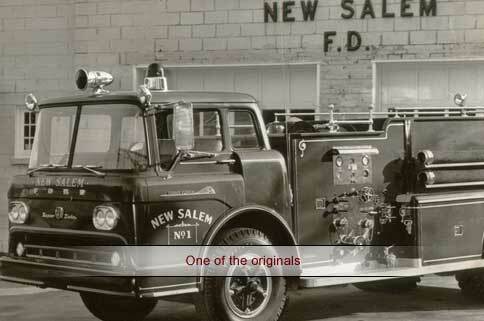 A year later, a new 4,000 gallon tanker was approved, and in 1996, the fiftieth anniversary of New Salem Fire Department was held. In addition, a newer bus was purchased for Fire Command. New 4,000 gallon tankers were added in 1998 and 2000; a donation of land to the Department was made by Alfred and Eleanor Higgins, and a new pumper, 1,500 gallons/minute was added in 2005. In addition to the equipment, construction began in 2001 for a new building; it was completed in 2002, and the old station sold. The following year, a new water system for Voorheesville gave New Salem some hydrants from Picard Road to the Village. In all of these details about the Town of New Scotland’s three fire companies and emergency medical services, the actual heart of each is found in the dedicated volunteers who give so unselfishly to protect the lives and property of their neighbors. Hours of time are spent studying, preparing, drilling, learning, testing — just to become firefighters or EMT’s or ambulance drivers or people who help by raising funds or serving hot coffee to their colleagues who are fighting a fire in winter. We of the Town of New Scotland are fortunate to live in such a town where people help one another, looking for no reward other than that someone’s property was saved from a fire or someone’s child was born safely or someone was given aid and taken to a hospital to recover from an accident. We salute our caring, courageous volunteers!